Should you go and watch Teenage Mutant Ninja Turtles this weekend? Look out, everyone: the Teenage Mutant Ninja Turtles are returning to our screens this weekend! And boy, are we looking forward to seeing them eat loads of pizza, wisecrack and kick som…hang on a minute, what’s happened to the cute little green fellas we knew and loved?! The Teenage Mutant Ninja Turtles remake has been controversial from the moment it was announced, with fans particularly angry about the involvement of Michael ‘Explosions Everywhere’ Bay, and the weird ‘realistic’ look of the turtles. The remake sees four young turtles rise from the sewers to save New York from the grasp of the evil Shredder, with the help of April O’Neil. Basically, it’s exactly the same as every other Teenage Mutant Ninja Turtles film ever made. Anyway, it’s finally released in the UK this weekend (a few months after the US). The big question is: should you go and see it, or should you save your money for pizza and a visit to the zoo instead? If you’ve got any unwanted movies cluttering up your home, sell your DVDs with musicMagpie. It’s fair to say Empire arent’t too keen on the latest Turtles adventure, awarding it 2 stars out of 5. Reviewer Olly Richards cites the movie’s lack of humour and the wafer-thin plot (which he describes as ‘…so wispy it might not actually be there at all.’) as the main problems with the film. His final verdict on the film boils down to just 5 words: ‘Heroes in a half-arsed shell’. Unfortunately, things don’t get much better for the little green dudes in Total Film’s review. Awarding the film 2/5, they call Teenage Mutant Ninja Turtles ‘soullessly efficient’ and ‘big, dumb and LOUD’. There are a few positives, though, with the magazine describing the film as ‘fun in parts’ and comparing it to ‘Transformers in a half-shell’ (which is probably a positive for some people!). Finally, a semi-decent review for the Turtles! The Mirror’s 3-star (count ‘em!) review of Teenage Mutant Ninja Turtles calls it ‘a deliciously daft bit of entertainment’ that is ‘full of fun’. They do pull the film up for lacking ‘the wholesome humour of the original’ but praise the ‘dazzling action sequences…and martial-arts mayhem’. Uh-oh, we’re back in 2/5 territory again. Reviewer Robbie Collins calls the film ‘dreadful’, but suggests that the fault may lie with the original Turtles movies, which he tars with the same brush. We’re not sure we agree, but to each their own! Surprise, surprise: it’s another 2/5 review! The Guardian reserve their criticism for the films many tie-ins, from the branded pizzas to the adverts shown in Times Square. They conclude that the film is a ‘repackaging of gleaming, empty, allowance-snaffling product’ before – like the Telegraph – suggesting that the original Turtles were a bit rubbish too. We’re not having that! 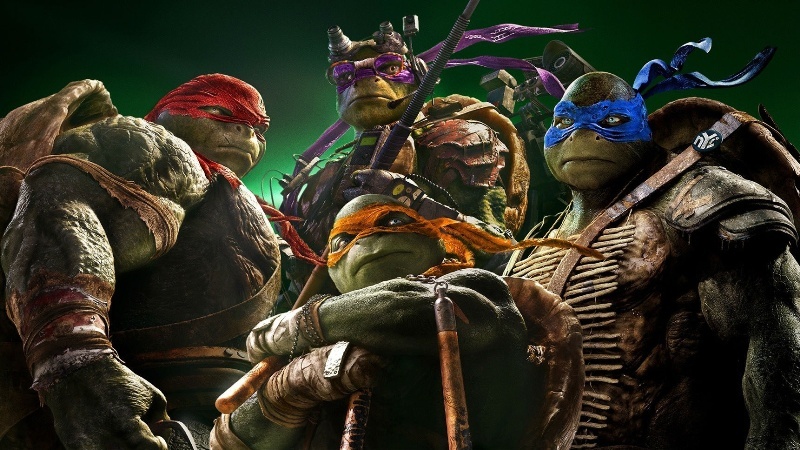 So, based on quick round-up of reviews, Teenage Mutant Ninja Turtles scores a firm 2 out of 5. Then again, like Michael Bay’s Transformers, it’s the kind of film most critics hate. And, like Michael Bay’s Transformers, it’ll probably make loads of money at the box office too. If you enjoy big, dumb action movies and pizza-munching karate-turtles, you’ll probably love it!